The neighborhood’s origins extend back at least to an 1835 land grant to Don Francisco de Haro to graze Mission Dolores’s cattle at the potrero nuevo (“new pasture”). 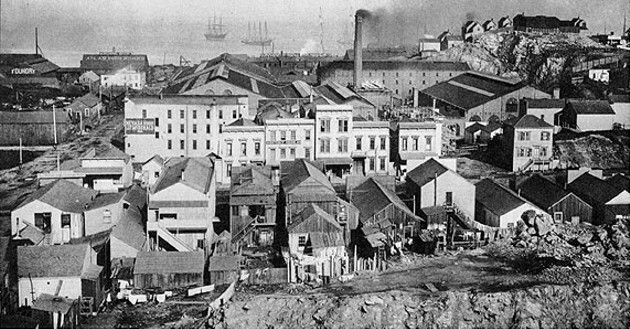 Gold rush squatters started pushing the herd aside and began the first of many waves of urbanization and immigration: Scots in the 1860s, then Irish, Chinese, Russians, Mexicans and finally African-American Southerners in the 1940s, building battleships at the bustling wartime shipyards. While families lived on the hill, flatland manufacturing by firms like U.S. Steel, the Union Iron Works, the Western Sugar Refinery, Bethlehem Shipbuilding Co. and American Can Co., among others, ensured that the area remained largely industrial through most of the 20th century. But a combination of deindustrialization and the late-1990s Internet boom began driving the conversion of factories and warehouses into housing or offices. New office construction continues on the north side, while condos rise on the hill’s eastern and southern edges, particularly in Dogpatch, the name given to the Third Street corridor between 16th and Cesar Chavez. One part of Potrero Hill that has changed dramatically is the Safeway shopping complex along 16th Street, between Bryant and Potrero streets. From 1931 to 1959, this was the site of Seals Stadium, an 18,600-capacity venue that hosted the San Francisco Seals and the Missions of the Pacific Coast League. When the then-New York Giants arrived in San Francisco, they played the 1958 and 1959 seasons at Seals Stadium while Candlestick Park was being built. A slowed down lifestyle with ample eateries, locally-owned and supported businesses and being a safe, friendly, dog-filled neighborhood. New office construction continues on the north side, while condos rise on the hill’s eastern and southern edges. City skyline: There’s a magical, almost Oz-like quality to the views north from atop Potrero Hill. The downtown skyline seems so distant — and yet is outlined so sharply against the blue sky — that the neighborhood can seem like another world. Jackson Playground: This site has fields for baseball and general running around, indoor and outdoor basketball courts and a playground. 17th Street (between Carolina and Arkansas streets), (415) 554-9527. McKinley Park: This small neighborhood park was recently renovated and improved, and has a playground, grassy areas, walking paths and great views west and south. 20th Street (at Vermont Street). This 120-year-old local brewery is the oldest craft brewery in California, though it didn’t find its current home (an old coffee roastery) until 1977. In order to walk through the three floors to see where the famous beer is made and get a tasting in the taproom, you must make a reservation (there are two tours every day). It takes about 1.5 hours and costs $20-25. The brewery is also home to Anchor Distilling Company, which only recently opened the doors to its tasting room. Tours are one hour and include a stroll through the edible roof garden, and a seated tasting of six spirits for $35. Blooms is exactly what a neighborhood watering hole should be: kinda run down, never too crowded, TVs playing sports, friendly bartenders, tons of regulars, pinball, cold beer, plus the one secret thing locals don’t ever really want anyone else to discover. In this case: the sun-filled patio with amazing views of the city. Chez Maman serves the kind of delectable French food your mom used to make—if your mom was a French woman who was not afraid to use a ton of butter, poured generous amounts of wine, and always thought you should order dessert. Because those odds are low, that’s one more reason to dine at this tiny 10-seat restaurant (plus a bar where you can eat). Must-order dishes include the French onion soup, escargot, any of the mussels, and the “basic” burger, which is anything but basic. The crepes are très bonne as well, but skip the savory version and order a sweet one for dessert. If you’re a Boston sports fan, then you already know about this old school sports bar that serves affordable comfort food (wings, meatloaf, potato skins, pastrami sandwich, BLT chopped salad, salt and vinegar fries) and drinks (there’s a full bar) to Red Sox and Patriots’ fans. The bar got a facelift a few years ago and everything, including the food, feels brighter and cleaner than before. There are plenty of TVs to watch the game, a pool table, and a small patio out back if you want to take advantage of Potrero’s sunny weather. 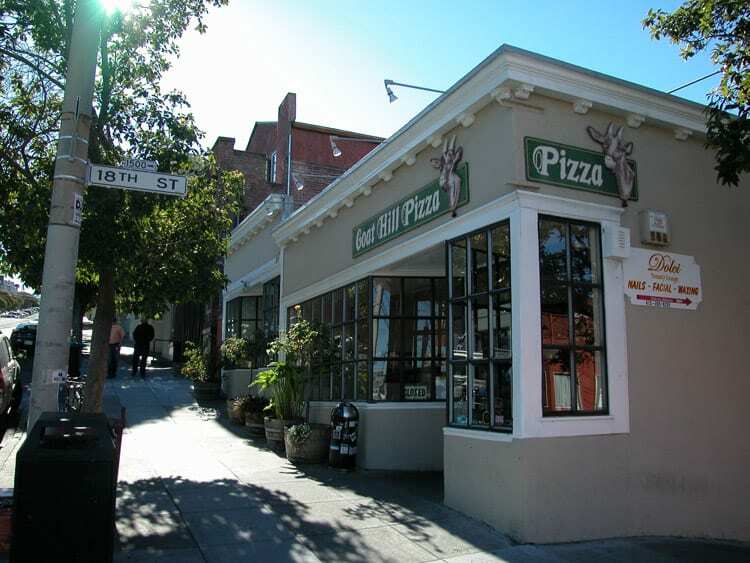 This is Goat Hill’s original location (named after the goats that used to roam Potrero Hill) and is as much of a neighborhood favorite now as it was when it opened in 1975. The pizza is made with a sourdough crust and baked in a traditional brick oven. And while it’s tasty any night of the week, it’s especially great on “Neighborhood Night” (Mondays between 4 and 10 p.m.) when it’s all-you-can-eat pizza and salad for $12.95. During that time the salad bar is self-serve and the pizza is served by waiters who dole out slices of whatever is fresh out of the oven. A great low-key diner-style spot for when you need to grab something and go, or grab something and eat it at one of the eight or so tables. The menu is extensive and everything can be ordered for pick-up if you’re in a rush. Breakfast options range from omelettes to pancakes to eggs Benedict, but our faves are the egg, cheese, and bacon sandwich ($4.25) and the breakfast burrito ($5.95). Lunch includes everything from over 15 different burgers ($8 to $11.50) to all kinds of sandwiches ($6.90 to $8.25), hot dogs ($5.50), and salads ($4.50 to $9.95). And, clearly, the prices can’t be beat. The perfect little spot to grab an espresso, pourover, or cold brew coffee on the way to work, then a glass of unique Italian wine on your way home. 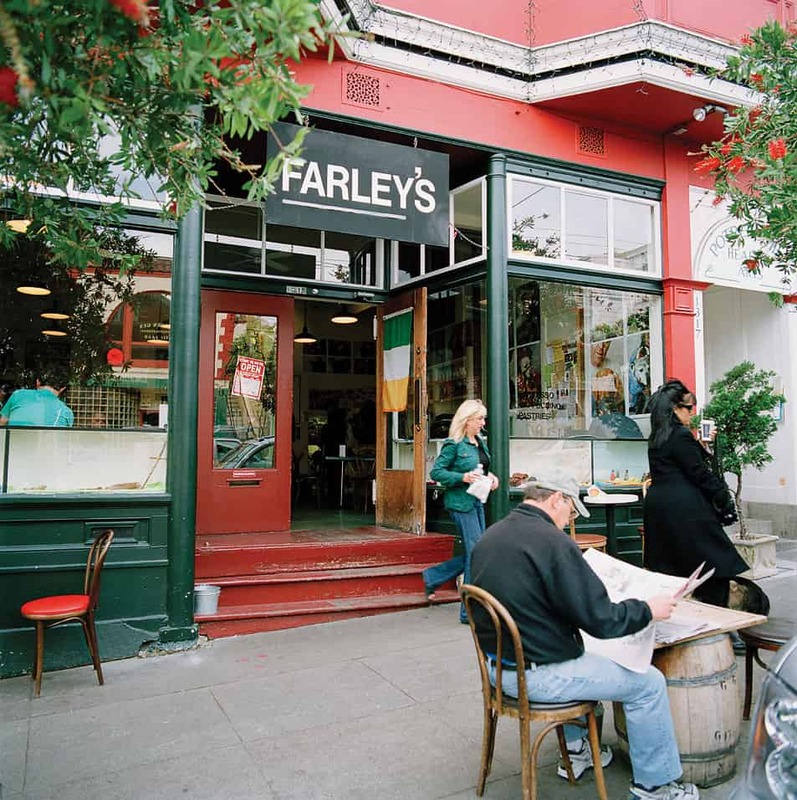 This coffee and wine bar is the closest thing you’re going to find to an Italian Café in Portrero Hill, including the very friendly service, a very good thing when you’re trying to catch a train (it’s right by the 22nd and Mission Caltrain station). There are also a few pastries (homemade poptarts!) and bagels in the morning, as well as salads and panini starting at 11 a.m. Also, there is a Nutella latte, which speaks for itself. The fish at this reasonably priced Japanese restaurant is flown in three times a week from Tsukiji Fish Market in Tokyo, the biggest wholesale fish and seafood market in the world. That means you can be assured that what you’re putting in your mouth is always incredibly fresh and of the highest quality. You can also be assured that, like the name suggests, some of those dishes will be served live, including the scallops, uni, lobster, spot prawns, and clams. Though the name is a little hokey, it’s hard to complain about a restaurant that focuses almost solely on macaroni and cheese. There are 12 variations on the menu ranging from a classic mac ‘n cheese with panko breadcrumbs, pecorino Romano, and extra sharp cheddar to a carbonara version to a mac with braised short rib, mushrooms, crispy onions, and Mt. Tam blue cheese. And, they’re all available gluten-free. Salads and non-mac entrees like fried chicken are also available. This rustic breakfast and lunch spot serves simple, seasonal comfort food sourced from local farms, and is also considered to offer one of the very best brunches in the city. Of course, this is San Francisco, so the wait for that brunch may be hours (Plow does not accept reservations or parties bigger than six). Every dish is pretty much perfection, but your best bet to get the full experience is to order The Plow (two eggs, a choice of meat—get the sausage, lemon ricotta pancakes, and Plow’s signature potatoes). Of course the fried egg sandwich is also delicious. As are the buttermilk biscuits and gravy. The good news is after the wait, you might just be hungry enough to try them all.